Last summer’s studio piece is now presented as a DVD and CD package and I have the CDs. What is immediately clear, without seeing the footage, is that the crowd want to be there as do the band. This just gets on with its progressive journey from the start and is generally a joy throughout. The sound isn’t always perfect though and the harmonised choruses in particular seem to wobble a bit. But what else is going on more than makes up for it. Morse has picked four from that latest album (the title track “Momentum”, “Weathering Sky”, “Thoughts Part 5” and the massive epic “World Without End”.) They all hold their own amongt the rest and the highlight, as with the album, is that sprawling masterpiece at over minutes long. This a great collection of live progressive rock and will probably become one of those must have packages for so many reasons. The skill is constantly on show although they can’t really save a cover of “Crazy Horses” (yes, that The Osmonds classic). As with many such live offerings the track listing is probably of most use to you with the simple advice to get your hands on this if Morse’s studio work is your thing. And possibly if it isn’t! Well, a live album can bring you memories, can excite you but at the same time warn you that it is not the same experience to live it than to just listening to it, my point is, I could witness a show from this tour last year, which was great, but the feeling is not the same now that I listen to this live album, which by the way, is much longer than the concert I attended to. So first of all I would like to say that both experiences are different, no matter how alike they are. When I left the concert I was happy, but there was something missing, maybe I am not the most keen Neal Morse fan, or maybe I just felt they are way too virtuoso to play, I don’t know, but now while listening to the 3 CD live album, I was actually bored at least half of it. 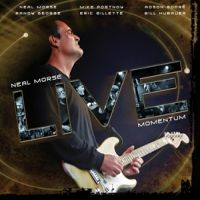 This live line-up consists mainly in Neal Morse, Mike Portnoy and Randy George, three very respected musicians whose talent cannot be denied, so musically talking the whole show deserves the best grade, they play note by note in a great way, they are truly connected and that is transmitted to the fans, so both, band and crowd are actually connected. The emotion of the first song is always unforgettable, when the band comes to stage while people cheer them loud is great, here I remembered how it was when they came to perform “Momentum”, a great opener actually. So one can be happy listening to a live album that lasts one or two hours, but when you see there are so many tracks left and those tracks are long, then you say “wait, I cannot listen to the whole album, it is so tiring” that experience happened to me, so I truly believe that you have to be a die-hard Morse fan to enjoy the 3-hour live album in all its extension, otherwise, there will be moments that you will surely want to skip. This time I won’t review track by track, I would never finish, but I could give you my thoughts on each CD. So the first one was actually my favorite, it might be because I had the will to start listening to it and I was not tired, but it might also be due to the track selection, a cool combination between “Momentum” and “Testimony” albums, the latter suite is a highlight from the whole concert. CD 2 starts with “Thoughts Part 5” which I love, but then the heavy cargo comes with “The Conflict” and “Question Mark”, maybe one as a progressive rock fan would feel pleased with such long epics, but this time I began to feel bored, sadly. The third CD is also nice, with once again a long track such as “World Without End”, but then Portnoy and his whims ruin it all, with a short cover version of “Crazy Horses” when he sings and Morse plays drums, it is terrible. The word (or name) Jesus appears one hundred times on the lyrics, and believe me, it is also tiring, so when they chose “King Jesus” to finish the concert one says “ok, I know Neal’s beliefs, but c’mon, we might be your sheep, not Jesus” haha just kidding, but something like that happened in Mexico too. So in general, musically and technically talking the album deserves at least 9 out of 10, but since I actually enjoyed half of it, the grade must be lower, 7 out of 10. With a 2-CD set, it would have stayed in 9, I am sure.